This very popular stereomicroscope is sold by our sister company Apex Microscopes. This particular unit is new and has only been used for customer demonstrations by ourselves and comes fully guaranteed. The Explorer plus is a turret mounted stereo with a choice of x20 and x40 magnification achieved by simply rotating the microscope head. In addition to the standard x10 eyepieces there are also a pair of x20 eyepieces which then gives the magnification options of x20, x40 and x80. Brightness controlled LED lighting both incident and transmitted. These can be used separately or together as required. Rack and pinion focus, stage clips and black/white dissection plate. Complete with custom made aluminium pilot style carrying case with double catch and carrying handle. Condition pristine. A saving of £50. Used only by ourselves for customer demonstrations this is one of the best value microscopes that we have ever sold. 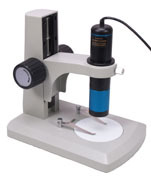 Stylish microscope body with coaxial coarse and fine focus controls. Mechanical stage with drop down coaxial movement controls. 6 v 20 watt halogen light source. Achromatic objectives x4, x10, x40 and x100 (oil immersion) with a wide field x10 eyepiece giving an overall magnification range of x40 to x1000. A fine microscope and fully guaranteed. One of our best bargains. This is a Motic biological entry level microscope with many features normally associated with much more expensive models and in good condition. Separate coarse and fine focus controls. Square stage with slide clips. Achromatic objectives x4, x10 and x40 with x10 wide field eyepiece. 240v tungsten lighting. Substage Abbe condenser with iris diaphragm. The ideal microscope for the office, workshop or home use. This unit can be used handheld or supported by one of three possible stands. The Desk Top Microscope is a digital system that provides an image directly to a laptop or PC for viewing. This microscope has a magnification range of x10 to x200 and has in built LED illumination with brightness control. These microscopes are professional standard,quality units and should not be confused with the numerous cheap and cheerful fun toys that are available on some of the larger shopping websites. The corded 1.3M unit connects by a USB lead to a USB2 on the laptop or PC and has a polarising filter built in that reduces the glare from reflective surfaces. The unit takes still images and video clips with the ability to make measurements on the captured images. Used only by ourselves for customer demonstrations. The Zoomview is a handheld microscope that can magnify up to x200 and display an image on any television through the AV port. Simply tune the television to the correct AV channel and the image appears automatically. The Zoomview is cordless and will work up to 30 feet away from its docking centre allowing the unit to obtain images from all sorts of difficult to reach places. The docking station simply attaches to the television via its AV lead and the Zoomview communicates with the docking station by wireless.The built in LED lights have a brightness control and produce really clear coloured images. There is a choice of four communication channels between the Zoomview and the docking station. The unit is powered by internal rechargeable batteries that will last for several hours between each charge. As well as being a handheld microscope, the Zoomview will also focus into the distance like a normal CC TV camera. In the box is the Handheld Zoomview Microscope, the docking station, transformer plug with recharging lead and the leads to connect the docking station to the television. For TV and projectors, but would need a TV video encoder to work with a computer. Used only by ourselves for customer demonstrations. Microzoom instruments that connect directly to computer are increasingly common these days. However this unit is somewhat different from the rest. This particular microscope is an assessment unit that we have used ourselves. The microscope zooms continuously from x10 to x60 with a working distance of 30mm. What is novel and unusual is that the image stays in focus throughout the zoom. When connected to a computer via USB the microscope has an inbuilt lighting system with rheostat brightness control. A good solid stand supports the optical system. Full software included. Highly recommended. Used only be ourselves for assessment purposes. 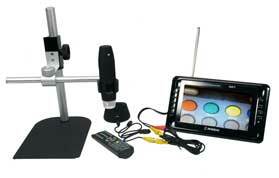 This is a new non digital version of our own digital microscope SP55D. Quadruple objective turret with x4, x10, x40 and x100 achromatic objectives giving an overall magnification range of x40 to x1000. Full mechanical stage with drop down controls and double vernier scales. Focusing substage condenser. Coaxial coarse and fine focus controls. 6v 20watt halogen illumination. Fully guaranteed. Gillett & Sibert were probably the last of the classic UK made microscope manufacturers to withdraw from microscope production. This is one of their later models and in good condition. Build quality was always a marker of G&S microscopes and this is no exception. Finished in grey enamel with black and chrome controls the microscope is all original apart from the wide field x10 eyepieces which are a recent improvement. Objectives x10 (0.28), x20 phase (0.50). X40 phase (0.70) and a x100 (oil immersion) with a numerical aperture of 1.3. Rheostat controlled halogen illumination.